One of the biggest stumbling blocks to discussing military careers is understanding the difference between officers and enlisted. The difference between enlisted and officer, depending on how you look at it, can be one of prestige, pay, responsibility, and future career opportunities. How Are Commissioned Officers Different? Historically, officers were prominent aristocrats or landowners who received a commission from the country’s ruler, giving them permission to raise and train military units. By contrast, the enlisted were “the common folk” the officers led into battle. It was once true even in the United States: Military units were raised for the Civil War by wealthy and prominent community members, who would obtain a commission to recruit and train the people in their hometown. Above all else, a commissioned officer's duty is to lead. 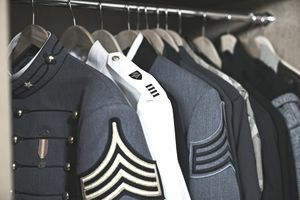 If the civilian equivalent of a private is an entry-level blue collar worker, and the sergeant that of a middle manager, then commissioned officers are the upper management and executives. No matter what specialty they enter, officers are expected to come out of training able to immediately take charge of about forty enlisted troops – a platoon. An officer’s career progresses by assuming larger commands and greater levels of responsibility – from a platoon to a company, a company to a battalion, all the way up to the cream of the crop as commander of a base, an operating theater (like European or African Command), or a position in the Pentagon. Occupational specialties for commissioned officers include management positions in virtually every field available to the enlisted, and several that are exclusive to the officer ranks, such as pilots and lawyers. But above all, a commissioned officer is expected to succeed as a unit commander in any situation, regardless of their technical area of expertise. In the Marine Corps, for example, every officer is expected first and foremost to be a capable infantry commander -- even if he or she is an administrative officer. Commissioned officers are expected to have a sharp mind and a well-rounded education, so with very few exceptions, they must possess at least a bachelor’s degree to receive a commission. Usually, it’s the degree itself that’s important -- not any particular major field of study -- because the officer’s primary trade is leadership. The service academies are the most prestigious route to an officer commission. Those fortunate enough to secure a seat in one of these military-operated colleges are usually the best and brightest of America’s high school graduates and get a free four-year education. It’s not your typical college experience, though: Students are considered service members, subject to military law and discipline, and must maintain high academic, physical, and moral standards at all times. Those that make it to graduation are commissioned in their academy’s branch of service and are also part of an elite fraternity among officers (similar to being the Ivy League graduate in your office). Other routes to an officer career are geared toward current college students (such as Reserve Officer Training Corps) or recent graduates. All require them to attend Officer Candidate School, a sort of leadership-oriented boot camp where candidates are not just trained but must prove themselves worthy of a commission. Enlisted service members who obtain a college degree may also apply to Officer Candidate School through their branch of service, and each service academy sets aside some appointments each year for those already serving. Advanced or specialized degrees are required of some officers, such as medical professionals, lawyers, and chaplains, for obvious reasons. Qualified professionals are often eligible for “direct commissioning” in the Army, Navy, or Air Force by attending a more abridged version of officer training that’s designed as less of a crucible and more, as the Air Force’s website aptly puts it, to “ease the transition of candidates . . . from the private sector into military life." Should I Join as Officer or Enlisted? The reasons people choose to go officer or enlisted are too numerous to discuss in one sitting, and often they have as much to do with personal goals and biases as they do with the facts. Many more enlisted troops are earning college degrees while they serve than in the past, but they choose to stay enlisted because they enjoy what they do. Some also find the idea of being an officer distasteful, because all officers are expected to participate in career politics. At the same time, those who enjoy the challenge of command or aspire to future careers as leaders of business and government can thrive as officers. Notice that many politicians who claim military credentials were officers: John McCain was a Navy pilot before he was a senator, Colin Powell was Chairman of the Joint Chiefs, and former Commandant of the Marine Corps James L. Jones served a stint as President Obama’s National Security Advisor. There’s no denying that a career as a commissioned officer presents a unique challenge and opens some very particular doors, for those who have what it takes to lead from the front.